For the first time ever in Las Vegas, we are pleased to announce our Virtual Driving simulator to train teen drivers, drivers requiring re-education and visually impaired (Low Vision) drivers. This exclusive driving simulator allows for safe driving skills before hitting the road. At our AAA Driving Academy, we are proud to offer training courses using cutting-edge driving simulation technology. In particular, these courses are suitable for teen drivers, drivers who require re-education, and visually impaired drivers (Low Vision). Our experienced instructors will oversee the lessons and conduct personal reviews with each student after each driving simulation session. The simulator creates a realistic environment and actual situations that allow the student driver to practice driving under totally safe conditions. The driver is challenged by hazardous situations that could occur in real-life. These situations can be reproduced infinitely – enabling an endless amount of practice driving before the driver enters a real vehicle. Does the simulator feel like driving a car? Yes, the simulator at our Driving School in Las Vegas uses state-of-the-art graphics to mimic the design of an authentic car, complete with brake and gas pedals, signals, dashboard, and windshield wipers. Driving simulators are designed using progressive virtual-reality hardware and software, as well as advanced projection technology. There is also an internal network of sensors that work to make the driving experience feel as close-to-real as possible. What driving conditions and road challenges can be replicated? 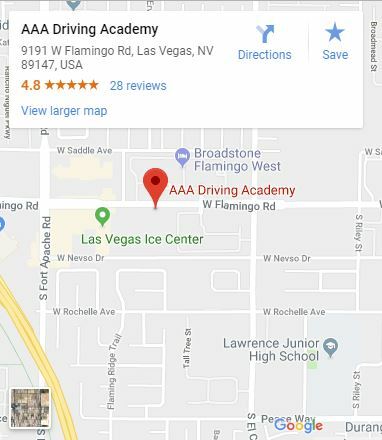 When you take driving lessons in our Las Vegas academy, we will expose you to as many different environmental and road conditions as possible – to prepare you fully for the real experience. Drivers need to confront complex road hazards in order to enhance awareness, rapid decision-making skills, and defensive driving techniques. What are the main benefits of driving simulation? Safe Intro to the Road: you will gather a great deal of safe driving experiences that you can use to help avoid problems once you are on the real roadway. Emergency Situations: when we teach driving lessons on the road in Las Vegas, there is a limited number of emergency situations to which we can expose our students. However, driving simulation allows student drivers to react to a wide variety of emergencies, safely practicing skills such as crash avoidance and how to deal with collisions. Customized Lessons: your instructor can create any situation, involving minimal challenges to more extreme driving situations – tailored to your skill level. Simulators also enable scenarios to be carefully designed to reflect what you may face on the roads in your area, including local weather and traffic conditions. Lesson Reviews: all of your driving simulation sessions are recorded. Therefore, your instructor can replay your driving sessions in order to review your responses and advise you on areas that need improvement and suggest alternative courses of action. Hazardous driving behaviors such as speeding, heavy braking, and following too close can all be observed. Who can benefit from driving simulation? At our Driving School in Las Vegas, we believe that every student driver – teens, adults, seniors – can benefit from practicing on a simulator. After using this technology, you will enter a real car and drive with much more self-confidence, because you’ll have mastered many essential driving skills. In particular, virtual driving simulation offers immense safety advantages for people with low vision and visual impairments. The high level of preparation can assist with learning how to respond to many potentially dangerous on-road situations. Read More about Las Vegas’ first Driving Simulator in the News.